"Oklahoma!" the first Rodgers and Hammerstein Broadway collaboration, opens to rave reviews. It enchants wartime audiences and will run for 2,212 performances. Hammerstein II successfully adapts Bizet's opera "Carmen" to an American setting in "Carmen Jones." Lorenz Hart dies of pneumonia. 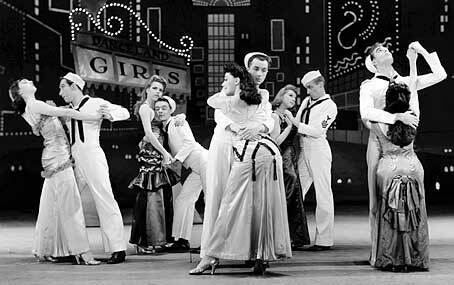 "On the Town" marks the Broadway debut of composer Leonard Bernstein, writers and performers Betty Comden and Adolph Green, and choreographer Jerome Robbins; songs include "New York, New York (It's a Helluva Town)." 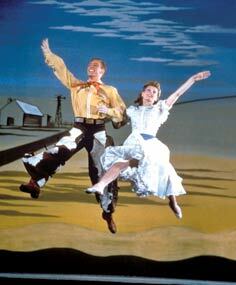 The first ever original cast album to be released, with songs from "Oklahoma!" -- "People Will Say We're in Love," "Oh, What a Beautiful Mornin'" -- tops the charts. 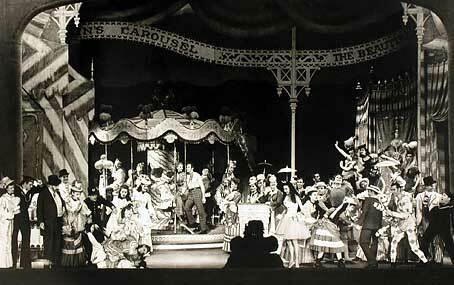 "Carousel" reaffirms the success of the Rodgers and Hammerstein partnership; songs include "If I Loved You" and "Soliloquy." 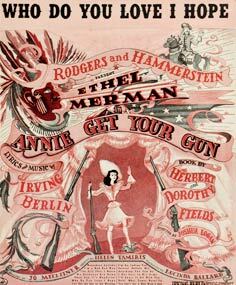 Irving Berlin writes the songs for his first "situation show," "Annie Get Your Gun," starring Ethel Merman; it includes "There's No Business Like Show Business." Harold Arlen and Johnny Mercer write "St. Louis Woman," an all-black musical. It flops, but produces the hit song "Come Rain or Come Shine." 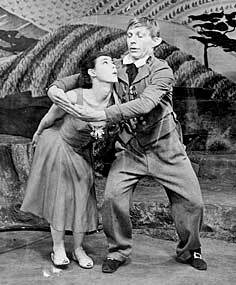 The team of Alan Jay Lerner and Frederick Loewe have their first big success with "Brigadoon." "Finian's Rainbow," an unusually political musical fable from E. Y. Harburg and Burton Lane, debuts; songs include "How Are Things in Glocca Morra?" The eagerly awaited original musical "Allegro" by Rodgers and Hammerstein opens; it receives mixed reviews and underwhelming box office revenues. Cole Porter's witty look at Shakespeare onstage and backstage -- "Kiss Me, Kate" -- debuts; songs include "So in Love," "Too Darn Hot," and "Brush Up Your Shakespeare." Television programs are broadcast out of New York and lure away many Broadway comedians and dancers, including Milton Berle and Jackie Gleason. Carol Channing becomes a Broadway star as Lorelei Lee in "Gentlemen Prefer Blondes." "South Pacific" speaks to an audience looking for tolerance and a new direction after the war; Rodgers and Hammerstein's show, directed and co-written by Joshua Logan, wins the Pulitzer Prize. "Lost in the Stars," a sobering look at racial strife in South Africa, is Kurt Weill's last musical. 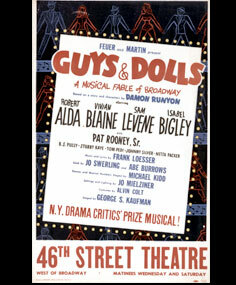 Frank Loesser's second Broadway score, "Guys and Dolls," is a huge hit; songs include "If I Were a Bell" and "Luck, Be a Lady." Ethel Merman teams up with Irving Berlin again for a spoof on Washington social life, "Call Me Madam"; songs include "You're Just in Love." Barbara Cook makes her Broadway debut as the ingénue in "Flahooley." Burlesque and movie comedian Phil Silvers spoofs TV star Milton Berle in Johnny Mercer's "Top Banana." 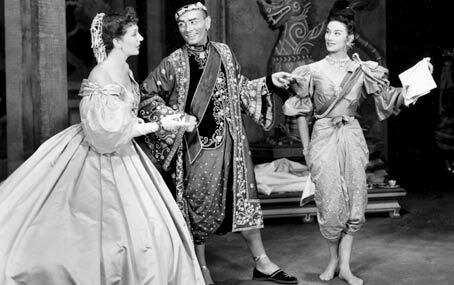 "The King and I" makes Yul Brynner a star and is another success for Rodgers and Hammerstein. Gertrude Lawrence, star of "The King and I," dies of cancer; she asks that Brynner get star billing in the show. A revival of "Pal Joey," produced by composer Jule Styne, is the first revival to run longer than the original show, which confirms its reputation. Rosalind Russell is one of the first nonsingers to play the lead in a musical, "Wonderful Town," created by Bernstein, Comden, and Green. 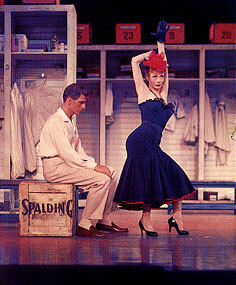 Dancer/singer/actress Gwen Verdon steals the show in "Can-Can" and wins her first of four Tonys. Perry Como makes "No Other Love" from Rodgers and Hammerstein's "Me and Juliet" into a number-one hit single. David Merrick produces his first musical, "Fanny." 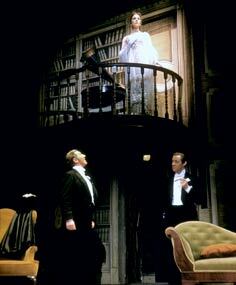 Nineteen-year-old Julie Andrews makes her Broadway debut in "The Boyfriend." "The Threepenny Opera" opens Off Broadway for a successful run of more than seven years. 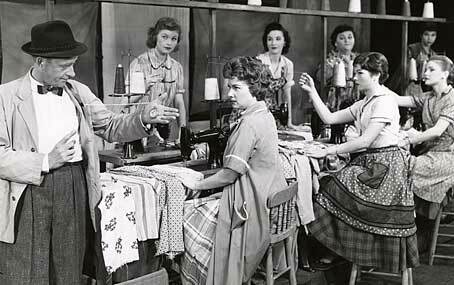 "The Pajama Game," the first musical produced by Harold Prince, opens. 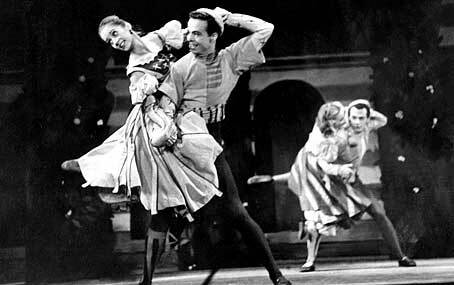 It is directed by George Abbott and Jerome Robbins and choreographed by Bob Fosse; songs include "Hey There." Cole Porter teams up with George S. Kaufman for the Cold War satire "Silk Stockings"; songs include "All of You." "Damn Yankees" is the second big hit for the songwriting team of Richard Adler and Jerry Ross ("The Pajama Game"). Ross dies of tuberculosis two months after the opening. "My Fair Lady," Lerner and Loewe's unlikely adaptation of Shaw's social critique "Pygmalion," opens and is Broadway's biggest hit to date: 2,717 performances. It makes Julie Andrews' career, turns Rex Harrison into an international star, and grosses more than $800 million over the next 20 years. Frank Loesser writes the music, lyrics, and book for the operatic "The Most Happy Fella." Judy Holliday conquers Broadway as the gamine lead of "Bells Are Ringing." 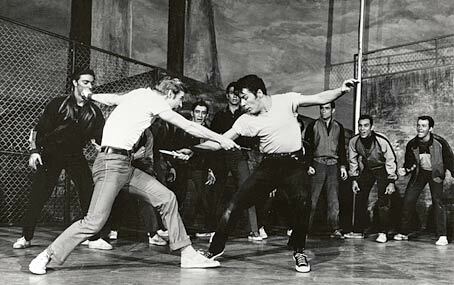 "West Side Story," directed and choreographed by Jerome Robbins, opens, with music by Leonard Bernstein and lyrics by Stephen Sondheim, in his Broadway debut. "The Music Man," a piece of charming Americana, stars Robert Preston in his first musical. He wins the Tony and the show defeats "West Side Story" for Best Musical. 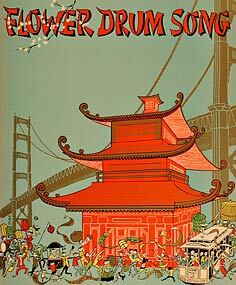 Rodgers and Hammerstein's musical comedy about cultural conflict in San Francisco's Chinatown, "Flower Drum Song," opens, with Gene Kelly directing (his only Broadway musical). British writer Kenneth Tynan becomes THE NEW YORKER's drama critic. He calls "Flower Drum Song" "the world of woozy song" -- a pun on a current play, "The World of Suzie Wong." Moss Hart's memoir of the theater, ACT ONE, is a NEW YORK TIMES bestseller. "The Sound of Music" and "Fiorello!" win the first and only tie vote as Best Musical at the Tonys. "Gypsy," with a score by Jule Styne and Stephen Sondheim, gives Ethel Merman the dramatic role of her career as Gypsy Rose Lee's mother, Rose. 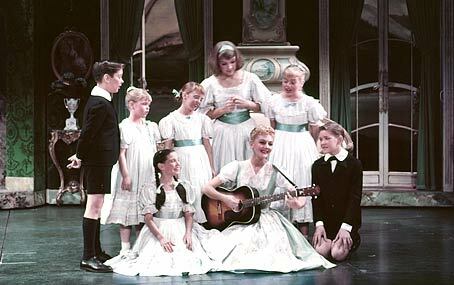 Both the show and Merman lose Tonys to "The Sound of Music" and Mary Martin.